We both absolutely loved Buenos Aires. It was such a beautiful city that had a very European feel to it – no wonder it is called the Paris of the South. As if that wasn’t enough, the city has fantastic restaurants that are so cheap – a thick steak and bottle of red wine will cost you about $25 NZD. Jervois Steakhouse eat your heart out! 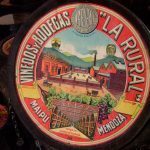 It also has some very funky fashion – really cool t-shirts, vintage clothing shops, leather – shoes, bags, belts etc we were in heaven. 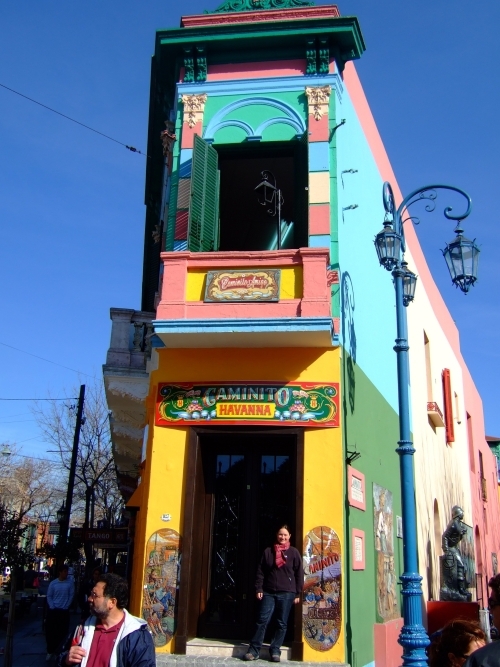 We stayed in the barrio (suburb) of San Telmo for 5 nights at a gorgeous house called Rick’s Place . The owner John has restored a gorgeous art deco style house and converted it to a guest house. But the real owners are Rick who is a 2 year old German pointer, 2 abyssinian cats called Tut and Kahmen, and the star of the show, a black moggy called Henry who formerly lived at a dance hall and made a living stealing sausages. So being the suckers for animals that we are, we felt right at home. 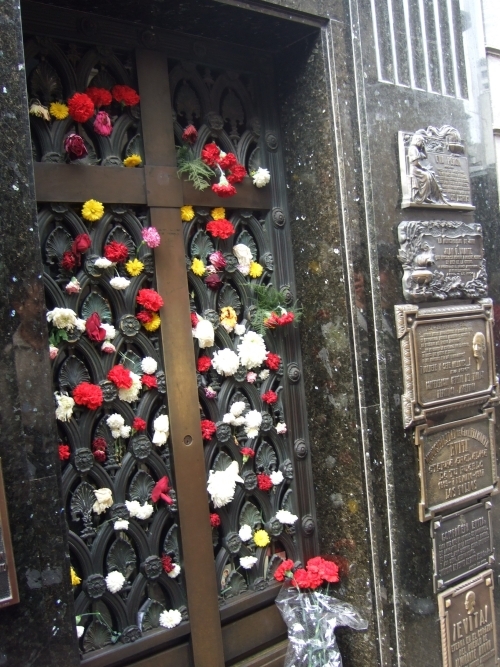 San Telmo was where the wealthy of Buenos Aires once lived until a yellow fever epidemic made them move on! It is also the home of tango. This combination of beautiful architecture, cobblestone streets and an amazing Sunday antiques market made it a great place to stay. 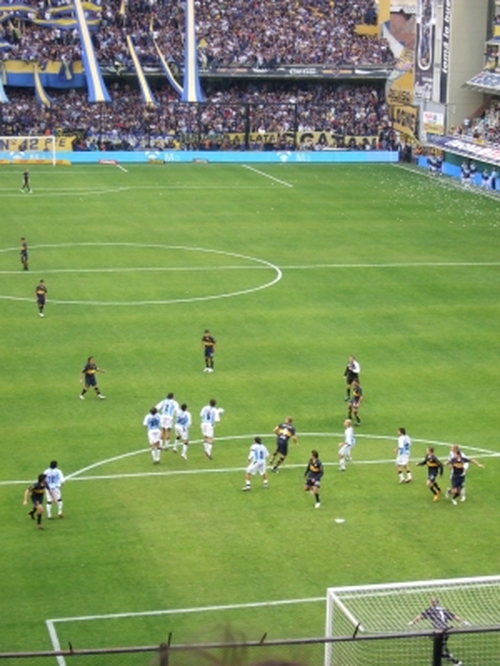 While in Buenos Aires we went to see Boca Juniors play Gimnasia at the Bonneberia (chocolate box!) Stadium. We went with this crazy guy called Juancho who picked us up in an old school bus, taught us all the Boca chants, took us to his local for beer and pizza down in Boca (an area that you normally wouldn’t hang out by yourself.) The pub looked like someone’s garage that they’d converted and was an absolute shrine to Maradona. Cheers!! Sitting next to Mike are Brendan and Clare, a couple from Cork in Ireland who are doing some of the same route as us who we have been hanging out with. Mike and Brendon with Juancho. He was completely mad. After more than a few beers, Juancho then took us to the standing only area to watch the match. It was jam packed and the atmosphere was amazing. 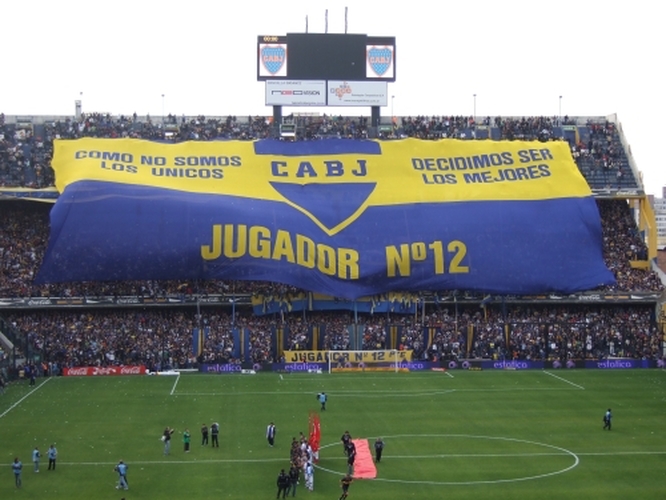 The Boca fans call themselves “the 12th man” because they reckon their singing, chanting and support of the team counts as much as having another man on the field. We think so too! The first half was typical Latin American football – kick the ball around and do lots of dives and pretend you’re hurt – but the second half was awesome – Boca won 4-0 and the atmosphere was electric. We had a great view from the stand we were in. 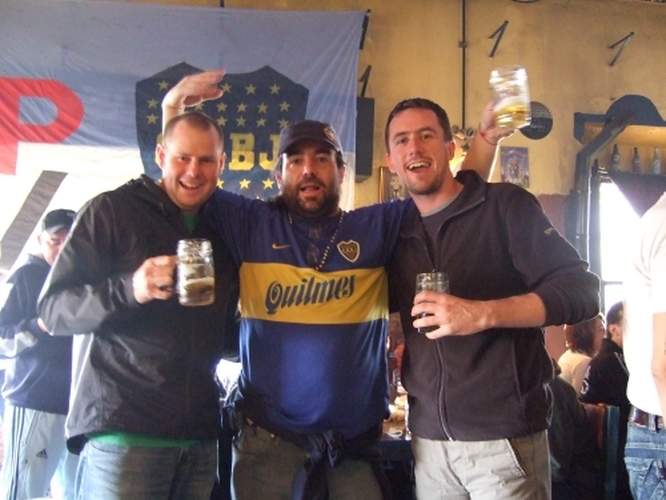 We thought it only fair that we celebrate Boca’s victory, so went to the pub for a few pints with Brendan and Clare. We then went to an amazing French restaurant which was so cheap (compared to NZ prices) for yes – more steak and red wine. Mike decided it was the time to tick another box on his life list and had steak tartare. It was actually pretty good. Check out the steak tartare with raw egg on top. Mmmmm. Needless to say, the next day was a little slow….. 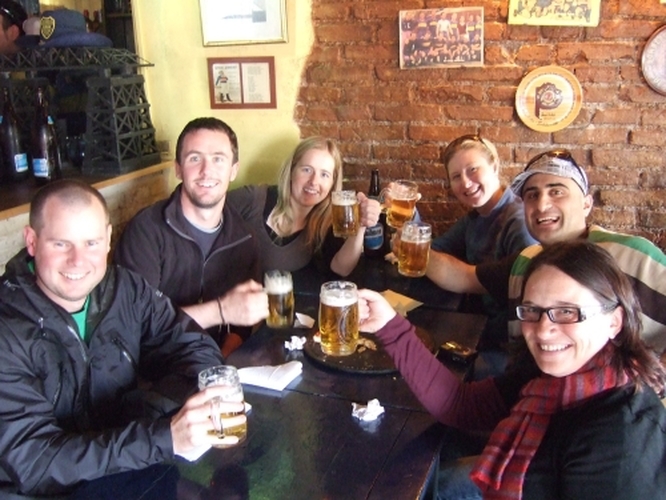 The rest of the time in BA we spent wandering the quaint streets, and eating eating eating. 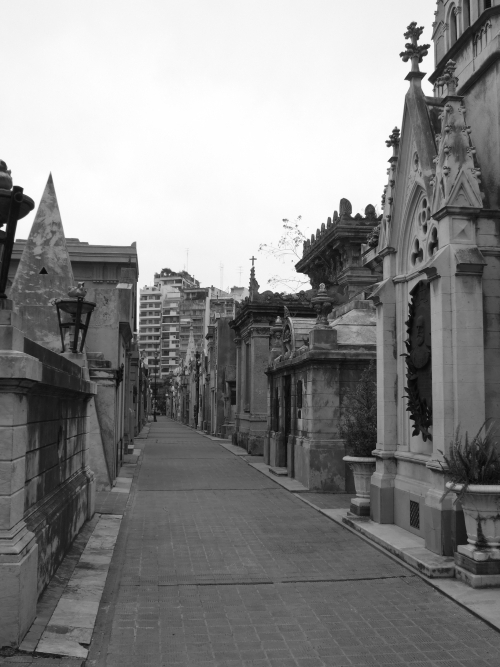 We also visited Recoleta cemetery which has lots of massive tombs, mausoleums and beautiful carved statues, so we took lots of arty-type photos. 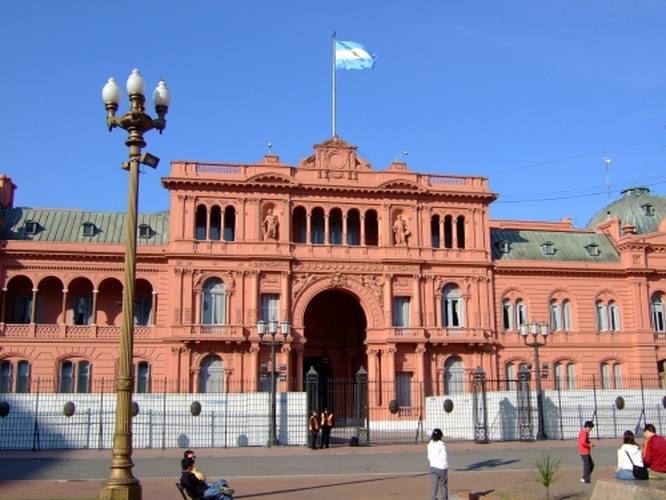 We saw the presidential palace – mostly famous because Evita stood on the balcony! We also visited El Caminito – a street in Boca where all the houses are brightly coloured (courtesey of the owners who originally nicked the paint from the dockyards where they worked). We weren’t very keen on it here as it was verrrrry touristy. 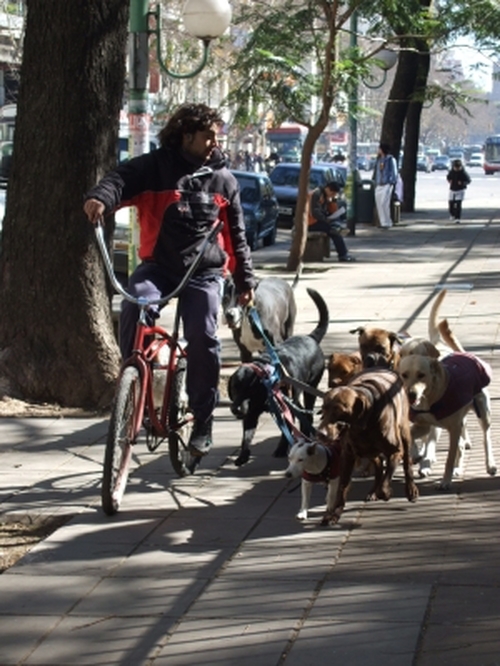 Recoleta and Palermo are the swanky areas of Buenos Aires, and any self-respecting dog in BA has to have a dog walker. It is common place to see people riding bikes and walking with 8-10 dogs in tow. The dogs seem to absolutely love it. And did we mention the food?? 😉 Like the Spanish, Argentinians eat late. Restaurants generally open around 8.30 – 9pm and things really get going around 11 – 12pm. It was not uncommon to see families turning up for dinner at 11pm, complete with school age kids and babies! 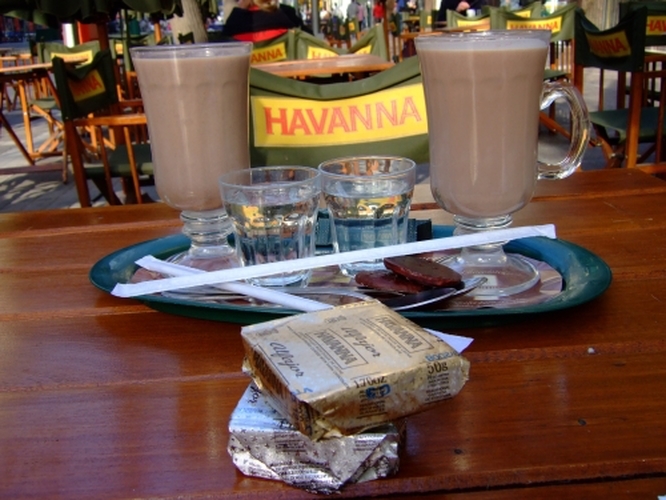 Not only is there amazing steak and wine, but Argentinians have a very sweet tooth. 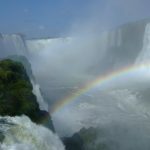 We got hooked on submarinos – hot milk with a chocolate bar which you drop in and stir around, and alfajores – yummy triple decker biscuits which are filled with dulche de leche (a type of caramel) and covered in chocolate. It is quite common to eat these for breakfast! 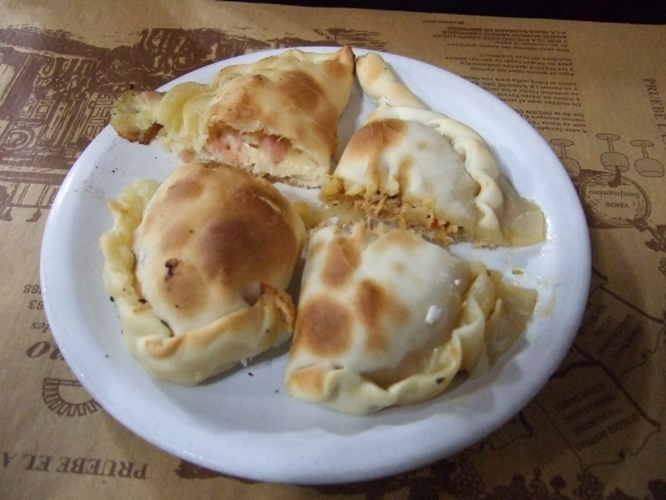 Our other favourite food is empanadas – little pies filled with mince, cheese, chicken, ham and cheese. They are highly addictive! Now that Georgie Pie is a distant memory, we think NZ urgently needs an empanada franchise. 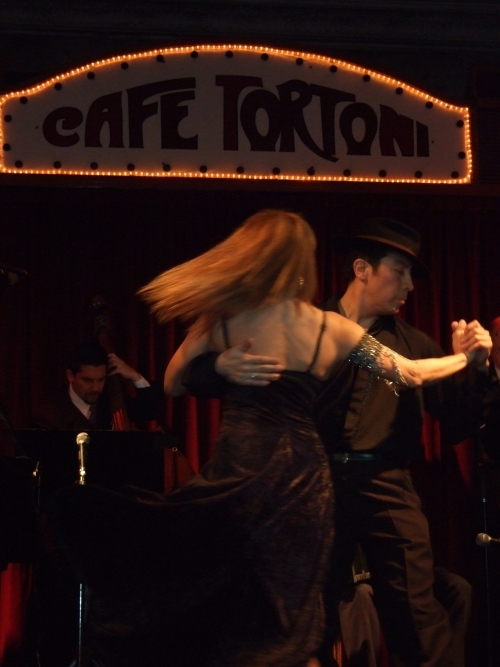 Finally, with Buenos Aires being the home of tango, we went to a tango show at Cafe Tortoni, one of the oldest cafes in Buenos Aires. The show was great with singing, dancing and music. We bought a great tango CD, so watch out next time you come to our place for dinner – we’ll have you up and dancing in no time!